Imagine if you had a full time employee at your disposal and his job was to turn every article you have written into a video and bring it's message to life? Wouldn't that be great? Well now you can but it's not a warm body, it's a software and at the end of this post there is a coupon code for 20% off for a limited time. 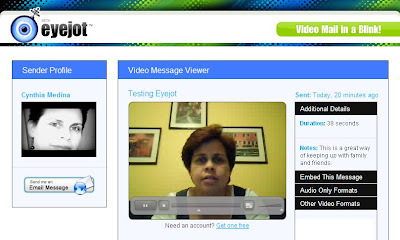 Just like there is the text to voice converter software now there is software that can generate videos from your text, how cool is that? It’s called Article Video Robot and it will convert your articles to LIVE and TALKING videos in minutes. Why is this so important? I believe you already know that article marketing is one of the best ways to generate targeted traffic and backlinks to your website. But there is another powerful tool that can be used to generate even more traffic. It’s called Video Marketing. Did you know Google loves YouTube? Google loves to watch videos just like you love to watch TV. Articles can take days or even weeks to get indexed by search engines but videos are indexed by Google in 15 minutes or less. One of the benefits of submitting videos to YouTube is the search results, it's different. Video results on Google are the only ones with a thumbnail and appear like paid advertising, but for free! Now if your video shows up in a search result, don't you think people are more likely to click on the thumbnail to watch your video then clicking on some one's boring link? Now that is powerful. Nothing can beat video marketing. So, if video marketing is so powerful why don't more and more people use it? It's because video marketing as powerful as it is, it's always been more time consuming, some technical skills are required and let's face it, it's more difficult to produce than a written article for the average guy. Article Video Robot is very simple to use. All you have to do is basically copy & paste your article into the software and it converts your article into a hot marketing video instantly! You don't even have to leave your desk or touch a camcorder! By the way did I tell that on top of audio, you can also add graphics to enhance your message? Another great feature is the easy submission to 17+ video sharing sites including of course, YouTube. This is powerful powerful stuff - don’t miss it. For a limited time you can get 20% off if you use the coupon code goingweb20. So what if your articles could talk? Who would they sound like? You've probably heard of Tom Dickson who has a very popular show on YouTube called "Will it blend". His show consist of throwing things into the blender and seeing how they come out. Well he was asked by the viewers to blend an iPhone and so he did. This video is the episode in which he blends it. If you're an iPhone fanatic like me, this video will hurt you as much as it hurt me. You can also view Tom's videos through the "Will it blend" iPhone app. Wouldn't it be great to quickly create video messages and send them via e-mail without having to actually use a camcorder and download files? Guess what? You can. 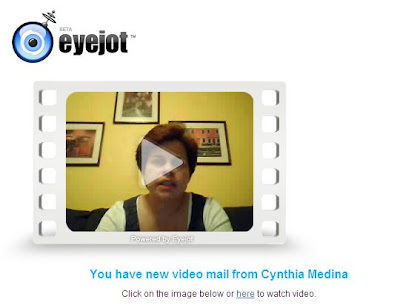 There is a service called Eyejot which let's you create video messages and e-mail them to anyone. All you need is a microphone (which can be built in your PC or laptop) and a web cam. Sorry you do need a web cam because your image has to be recorded some how, right? But that's it! 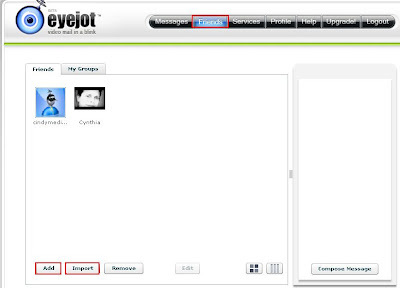 With Eyejot you can import your contact information from several address books or manually add them. 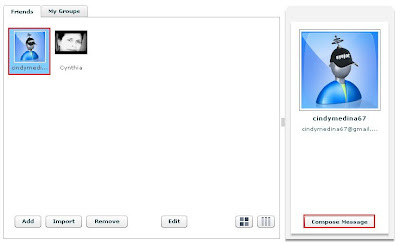 You can also create contact groups in case you want to video message a group of people. To start recording, select the person or group you want to send a message too and click Compose Message. Once you do that the service will read your web cam and the following window will display. 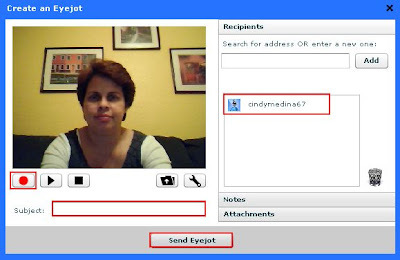 BTW, it's not mandatory to select a contact before you start recording, you can add the contact information from the Create an Eyejot window by either searching for the contact name or entering the actual e-mail address. If you select a contact from your account, the person's e-mail (s) will be added to the right side of the screen. To record your message press the record button, and after you're done press stop. Like all recording devices you can play the video to review it and if you're not happy with it press record again. After you're done recording just enter the Subject, and press Send Eyejot. The recipient will receive an e-mail with the video embedded in it so they can play it right from there or they can click the link included in the e-mail to watch video. This is a sample of the e-mail. If the recipient clicks on the watch video link in the e-mail they will be sent a video page where they also have the option to embed the video. As all web 2.0 services your account comes with a profile page where you can showcase your about me information including a video introduction. 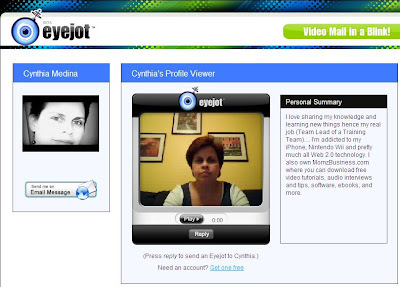 Eyejot has several types of accounts and one of them is free. With their free account you are limited to creating 60 second videos. It you feel the need to create longer videos you can upgrade to their paying account which offers 5 minute long videos. Another way you can use this service is to market your business. Think about, a short and sweet personal message sent to your mailing list instead of a cold text e-mail? Wouldn't that give your message a more personal touch? Here is a sample video message I created to test the service. I personally give it a 4 star rating, and really recommend it but don't just take my word for it. Try it out, it's free. Have you use this service or any other service similar to this? What has been your experience. BTW, thanks to my Twitter friend AgustinaP for mentioning this service. In this day and age there are so many programs available for free that it's just not necessary to spend any money. In this post I'm giving you some alternatives to PhotoShop, MsOffice, and Antivirus/Security programs that will be of great benefit. OpenOffice - This suite has applications that look very similar to MsOffice. They have Writer (Word), Impress (PowerPoint), Math (Excel), and Base (Access). The best part is that you can even save your documents as MsOffice documents so anyone with MsOffice can open and work on the documents. It's a very easy suite to learn if you know MsOffice because even the menus look similar. Just like MsOffice, OpenOffice has templates available within the applications and also has more available online for you to download for free. Google Docs - Is a free suite that has also similar types of documents as MsOffice as well. This suite is available by logging into your online Google account and any documents you create are saved online. The great thing about Google Docs is that you also have the option to save the documents on your PC as either as PDF, PPT, Doc, XLS and other types. Just like MsOffice, Google Docs has over 400 templates available for you to use. You can also manage your documents through facebook by adding the Google Docs application. If the login credentials are the same for facebook and Google when you add the application it will automatically interface with your Google Docs account. Another great feature Google Docs is the share feature. You can share your documents with others and allow them to edit the documents. Since this is an online application you also have the advantage of being able to organize your documents by folders just like in your e-mail inbox. Check out Google Docs in Plain English video. PhotoShop is a great application for those that really need to edit images and photos. For the average person that only needs to do some minor changes and effects to their photos or graphics there are other solutions that work very well and that are free. Picnik - This is a great online photo and graphic editor. They have a free version and also a paid version ($24.95 a year) but trust me, the free version is enough. With Picnik you can crop, resize, rotate, apply special effects, fine-tune your results and all of this is working from on your browser, there is nothing to download. You can select photos available either on your PC or available on any of your accounts in MySpace, flickr, facebook, photobucket, Picasa, Webshots, and Webs. Picnik is available as an application on facebook and you can manage both your online account photos and your facebook photos. Just remember to Sign in if you need to access your online photos. SplashUp - is another great alternative to PhotoShop and it's probably the one that has the most common features as well. SplashUp is another online editor with a twist. 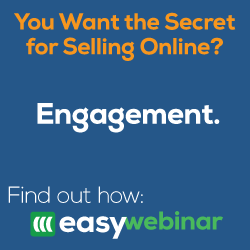 Sign up for a free account but don't be discouraged by the tools showcased on the home page, that's nothing. When you click on Jump Right In on the Home page, a new window pops up with the editor which looks very similar to it's contender. The nifty online editor has multiple image editing, pixel-level control and layers. You can work on images located on your PC or on facebook, Picasa, flickr, SmugMug, photobucket or display an image by URL. You can also save your images on these sites as well. There are several free alternatives available that work just as good as any paid Antivirus and Security software. Avira AntiVir Personal - This software includes AntiSpam, AntiSpyware, Firewall, EMail protection and Parental control. Microsoft Windows Defender - This software protects your PC against pop-ups, slow performance and security threats caused by spyware and other potentially unwanted software. This comes automatically with Windows Vista and it's also compatible to Windows XP. Avast Home Edition - Great full AntiVirus software. The only thing some people may not like is that when you initially register the software you receive a license key only good for 60 days and then you need to register again to get license key good for 1 year, and you must register annually after that. But hey the software is free! Before you buy any software search on sites like download.com, tucows.com, and Freeware Files. You can also do a search on Google for example, search for free antivirus software. Chances are you will find a free version of it. After you find names of free software, search for reviews on it. Even though it's free you don't want to use something that doesn't work, right? You can find a bigger list of free alternative software at Web 2.0 Applications Reviews wiki. What free alternatives do you use? Or tell us your experience if you've used any of the software mentioned in the post.